Preview: Bengal Warriors take on Tamil Thalaivas in the first game of their home leg at the Netaji Subhash Chandra Bose Indoor Stadium in Kolkata on Friday. Bengal Warriors will look to leapfrog Telugu Titans into the final qualifying spot from Zone B with a victory. With six games in hand, Bengal Warriors are the frontrunners to qualify for the Playoffs alongside Bengaluru Bulls. The two sides have met twice previously this season with Bengal Warriors winning both encounters. The last time the two sides played, Bengal Warriors came up with an all-round performance to win by seven points. Captain Surjeet Singh returned with a High 5 while substitute Bhupinder Singh turned the game around for Bengal Warriors. Amit Hooda returned with a High 5 for Tamil Thalaivas. PO Surjeet Singh has been Bengal Warriors’ leading defender with 38 tackle points in 16 games this season with 16 tackle points coming in the last five games. Singh scores these points at 2.38 tackle points a match. 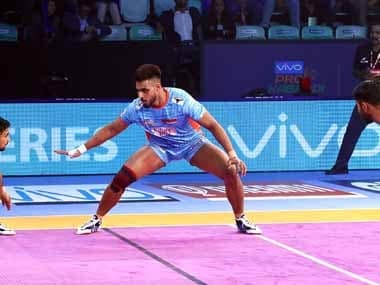 Singh however, managed six tackle points the last time these two sides met and will be looking to create an impact again against a Tamil Thalaivas offence led by Ajay Thakur. Ajay Thakur has scored 181 raid points in 20 games to be Tamil Thalaivas’ leading raider so far and the league’s fifth-best raider. Thakur scores his points at an average of 9.05, the sixth best in the league. Thakur is the only Tamil Thalaivas player to score a Super 10 this season, and two of his six Super 10s have resulted in victory for the side.